With longer life spans and increasing technology, there is still plenty of time for Baby Boomers to begin again and have a joyful life. Starting over after divorce, as many Boomers have discovered, offers the opportunity to create and have new dreams. Even dating is very different from when most Boomers were teenagers. A divorced Baby Boomer has better odds of creating a meaningful relationship because of life experience and self-awareness. 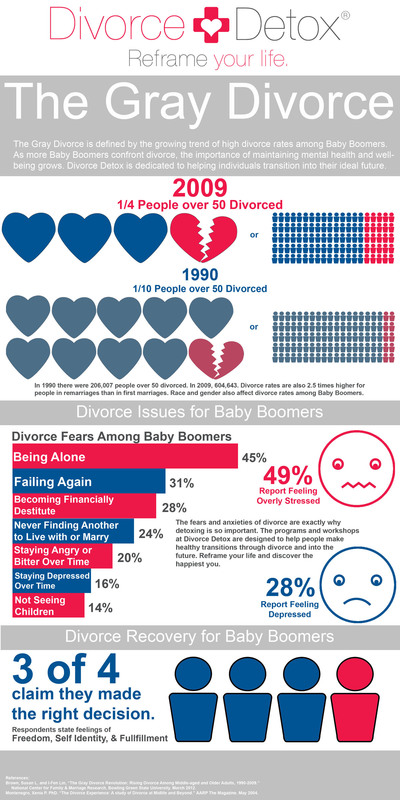 While the thought of divorcing after 50 may seem especially more painful because of longer shared memories or fears of being alone in later years, research by the National Center for Family & Marriage Research, Bowling Green State University shows that the age and experience of Baby Boomers, one of the largest demographic groups for divorce, make them better equipped to handle the challenges associated with divorce. With an open mind and a willingness to explore the possibilities of life after divorce, most people change their attitude about divorce once they heal. In an AARP study, three out of four divorcing Boomers state they made the right decision to divorce. There is much more of life to live, even when divorcing after 50. For Boomers experiencing divorce, these tips will help you navigate the emotional tribulations ahead. Remember, it is never to late to restart your life. Develop Self-Compassion - People of all ages have a hard time forgiving themselves for the mistakes of the past. Many allow these mistakes to linger in their psyche and poison their future. Instead of dwelling on the things that have already occurred, take time to forgive yourself for the mistakes you have made. Be kind with your psyche; treat it as you would a dear friend. Create a New Support System - You may find yourself estranged from your former social network. Although many people over 50 find the idea of creating a new network challenging, there are many ways to facilitate this. Try volunteering with a charitable organization or taking a part-time job. Work with newborns in the maternity ward of your local hospital, walk dogs at the local animal shelter, or become a docent at a museum. Helping others will help you gain perspective on your own situation and will create meaningful interactions with others. Engage with Technology - Technology can be a gift during divorce. People who divorce in later years often feel alienated from others. The reality is that most alienation is self-imposed. Socializing today is dramatically different than it was even ten years ago. Embrace technology! Learn to use social media sites like Facebook and Google+. Experiment with online dating. The benefits for dating online are immense: you can filter your interests and meet people who match your criteria. Dating online has a much higher relationship success rate than traditional modes of dating. Technology can be your friend. Heal Your Emotions - Find a divorce program or coach to process your emotions and develop your emotional intelligence. Divorce increases stress and instances of depression. These emotions do not have to linger, they can be treated and adjusted with education. As your emotional intelligence grows, you will be able to develop smarter relationship intelligence. The key to a healthy relationship in the future is having a healthy understanding of yourself. Attend Social and Family Events - After separation, events and gatherings with friends and family will still occur. Attend these events with the ultimate goal of being friendly with your ex, just avoid uneasy and emotionally precarious interactions with one another. When your emotions are raw this may be more difficult, so ease yourself into this new dynamic by trading off various family and social events in the early stages of separation. These types of arrangements make it easier on everyone involved. You also may consider bringing a friend to alleviate some of the awkwardness between you and your ex spouse. Rediscover a Passionate Life - Use your divorce as an opportunity to reawaken your whole life. Explore your interests with other like-minded people or seize the chance to develop new passions. Join a book club, take acting classes, or start a knitting circle. Keep a positive attitude towards life and avoid feelings of bitterness. Getting a fresh start will lead to a life that is not only happier but considerably longer and healthier! Dealing with Adult Children - Even though your children are mature, it does not mean that they need to be your friend or coach through divorce. Be careful to avoid becoming a burden to them. Don't share the gory details of your divorce. Concentrate upon helping yourself rather than saddling others with your problems. Instead, focus on improving your relationships and strengthening parental bonds. Avoid taking on your children's feelings. Their feelings and opinions are their own and you may gently remind them of this. Check in with your children regularly with support and love. Date Again - Approach the dating experience with an emphasis on compatibility, friendship and companionship. Stay in the present; let the past remain in the past. If you spend all your time looking in the rearview mirror, you will miss the limitless future opportunities that remain before you. Although dating has changed, there is no need to become discouraged. Fine-tune your rusty and outdated dating skills by speaking to a professional. Make a list of fun events and activities that you and your date can enjoy together. When you are finally out with that special someone, do not engage in discussions about your ex-spouse or your past marriage, simply mention it. Base the new relationship exclusively upon the present and begin building new memories in the here and now. If you are having trouble meeting people whom you are genuinely interested, consider visiting an online dating site like eHarmony. Millions of people around the world have found that these services make the dating procedure far, far easier. Last but not least, be sure to wait until you know your new date extremely well before introducing them to your family and friends. You mustn't take things too seriously too soon! Brown, Susan L. and I-Fen Lin, "The Gray Divorce Revolution: Rising Divorce Among Middle-aged and Older Adults, 1990-2009." National Center for Family & Marriage Research, Bowling Green State University. March 2012. Montenegro, Xenia P. PhD. "The Divorce Experience: A study of Divorce at Midlife and Beyond." AARP The Magazine. May 2004. Stanford Center on Longevity.